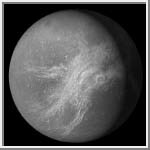 Dione [dy-OH-nee] was discovered in 1684 by Giovanni Cassini. It is an icy body similar to Tethys and Rhea. Its density is 1.43 gm/cm3, which makes it the densest moon of Saturn other than Titan. Dione is probably composed of a rocky core making up one-third of the moon's mass, with the rest water-ice. Its ice coverage is less than that of Tethys and Rhea. Dione's icy surface includes heavily cratered terrain, moderately cratered plains, lightly cratered plains, and wispy material. The heavily cratered terrain has numerous craters greater than 100 kilometers in diameter. The plains area tends to have craters less than 30 kilometers in diameter. Some of the plains are heavily cratered while others are not. Much of the heavily cratered terrain is located on the trailing hemisphere, with the less cratered plains area existing on the leading hemisphere. This is opposite from what some scientists expected. Shoemaker and Wolfe proposed a cratering model for a tidally locked satellite with the highest cratering rates on the leading hemisphere and the lowest on the trailing hemisphere. This suggests that during the period of heavy bombardment, Dione was tidally locked to Saturn in the opposite orientation. Because Dione is relatively small, an impact causing a 35 kilometer (21 mile) crater could have spun the satellite. Since there are many craters larger than 35 kilometers (21 miles), Dione could have been repeatedly spun. 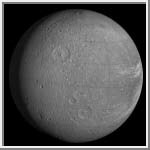 Dione has probably been tidally locked in its current position for the past several billion years. This is reflected in the average surface albedo of the leading and trailing hemispheres. The surface albedo decreases from the leading to the trailing hemispheres due to a higher micrometeor dusting on the leading hemisphere. The origin of the bright wispy material is somewhat obscure. Apparently, it is material with a high albedo and is thin enough that it doesn't obscure the surface feature underneath. It might have formed from eruptions along cracks in Dione's surface that fell back to the surface as snow or ash. Boyce, J. M. and J. B. Plescia. "Crater densities and geological histories of Rhea, Dione, Mimas and Tethys." Nature, 295, 285-289, 1982. Moore, Jeffrey M. "The Tectonic and Volcanic History of Dione." ICARUS, 59, 205-220, 1984. Plescia, J. B. "The Geology of Dione." ICARUS, 56, 255-277, 1983. Soderblom, Laurence A. and Torrence V. Johnson. "The Moons of Saturn." Scientific American, January 1982.